January 14th, 2016, Charlottetown – Island short-track speed skaters opened their 2016 competitive campaign with a trio of medals and a new provincial record in St. Andrews, N.B. recently. Kristen Binns (division 3), Alex Rogers (division 5) and Rob Binns (division 1) each earned bronze medals for the five member P.E.I. contingent. Rogers, of Charlottetown and Kristen Binns both made their way to the podium for a third time this season after personal best times in their respective 400 metre events. Stratford’s Andrew Binns set a new provincial record at a recent short-track speed skating meet in St. Andrews NB. The P.E.I. contingent also picked up three medals at the opening meet of 2016. Photo courtesy of Kristen Binns. Also competing for P.E.I. were Matt Kozma and Andrew Binns, both in division 3. Kozma notched personal best times in all three of his timed distances enroute to a 5th place finish, while Binns had PBs in the 1500 metre event, as well as in the 200 metre distance, where he improved on his own provincial record time for 12 year-old boys. Saint John club members Tyler MaGee and Maggie Oliver claimed the top overall titles for male and female skaters at the meet, which featured 108 skaters from seven clubs in New Brunswick and P.E.I..
Next on the calendar for the Island short-track squad are regional meets in Hampton and Dieppe, NB. Island competitors are looking to earn positions in the Canada East Short Track Championships, being hosted in Charlottetown on March 26 and 27. The Canada East event will bring the top 11 to 15 year-old speed skaters from Ontario, Quebec, the Atlantic Provinces and Nunavut to the Eastlink Centre for the highest level of speed skating competition hosted in P.E.I. since 1997. 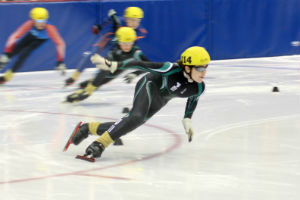 For full meet results and more information about Speed Skate PEI, visit www.speedskatepei.com.